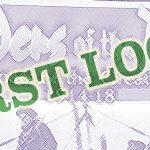 Raiders of the Deep – First Look! 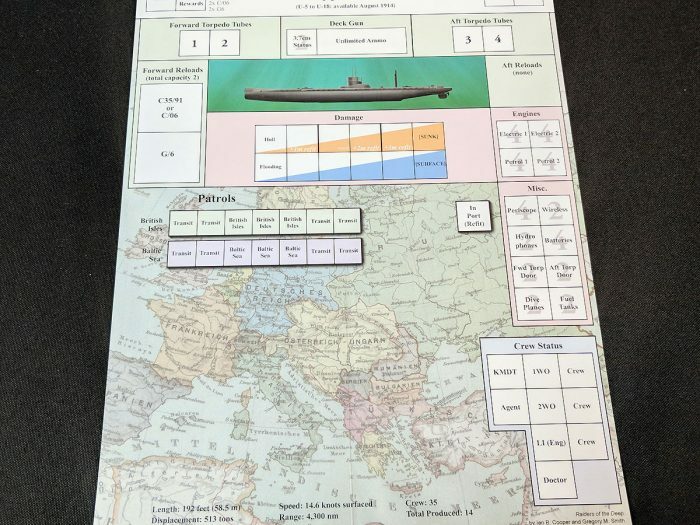 It seems that the solitaire wargame market for submarines is picking up steam (a harr a harr) in the last few years. Silent Victory, Silent War, Target Bearing 023 Degrees, Operation Drumbeat, The Hunters…there’s plenty of options, including this title, Raiders Of The Deep from Compass Games. 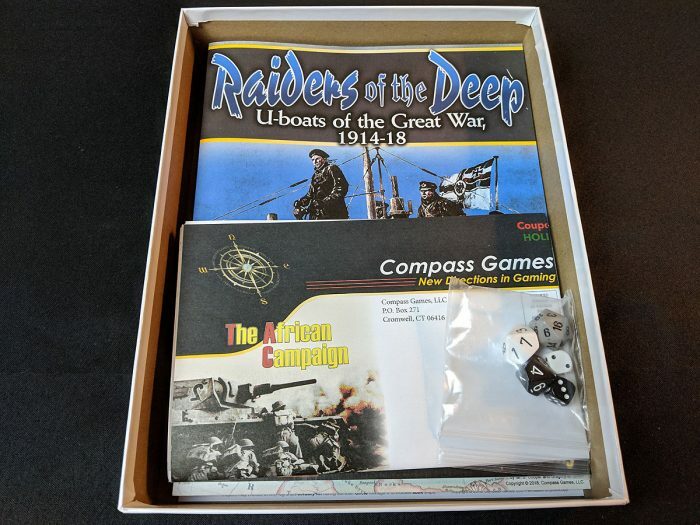 Based on the same system that The Hunters and Silent Victory use, Raiders Of The Deep puts you into the role of a German submarine commander in World War I. This is a very intriguing prospect to me, being based in World War I, when submarine warfare really came into its own. Some of the German submarines at the outbreak of war were tiny things that could hold maybe 15 sailors and two torpedoes, but they evolved quickly over the following years of The Great War. 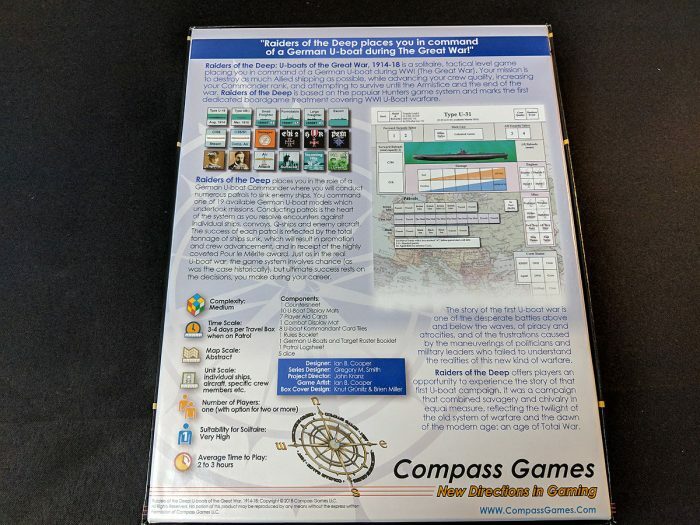 In this game, your role involves much in the way of role-playing elements – keep your crew alive, increase their skill level, get promotions and decorations, and hopefully survive until the Armistice in November 1918. 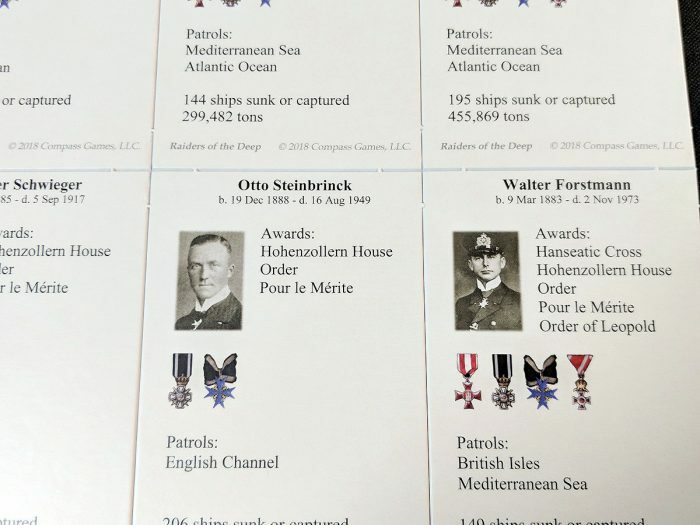 As bloody as World War I was on the surface, it didn’t really come close under the sea when it comes to U-Boat losses (in World War I, the Germans lost 217 U-Boats, while in World War II, they lost over 700), but consider the odds. The Germans had 351 U-Boats and lost 217 of them, which means just over 60% of U-Boats were sunk (compared to about 75% of U-Boats in World War II). Your odds of survival are apparently not so good. But it will be fun to try! Upon opening the box you’re greeted with, besides that new game smell, the sight of a very large advertisement insert. 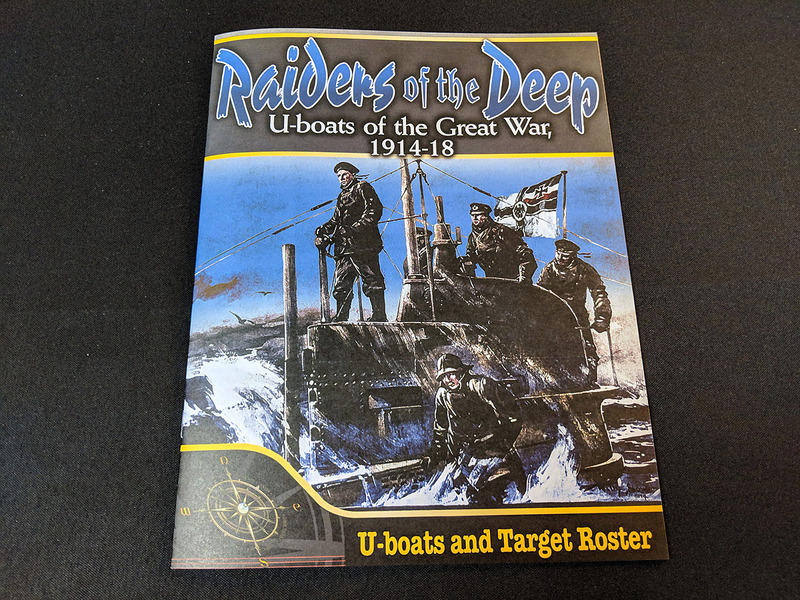 There are two main books, a Rule Book and this U-Boats and Target Roster – both look the same on the outside, with the exception of the titles. 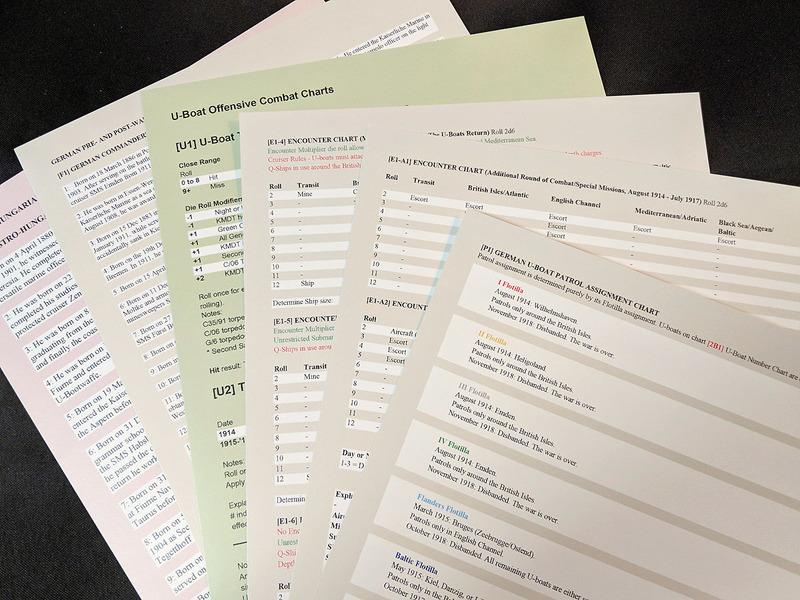 The Rule Book is relatively dense text-wise, with three columns per page and a few full color examples, coming in at about 25 pages of content. 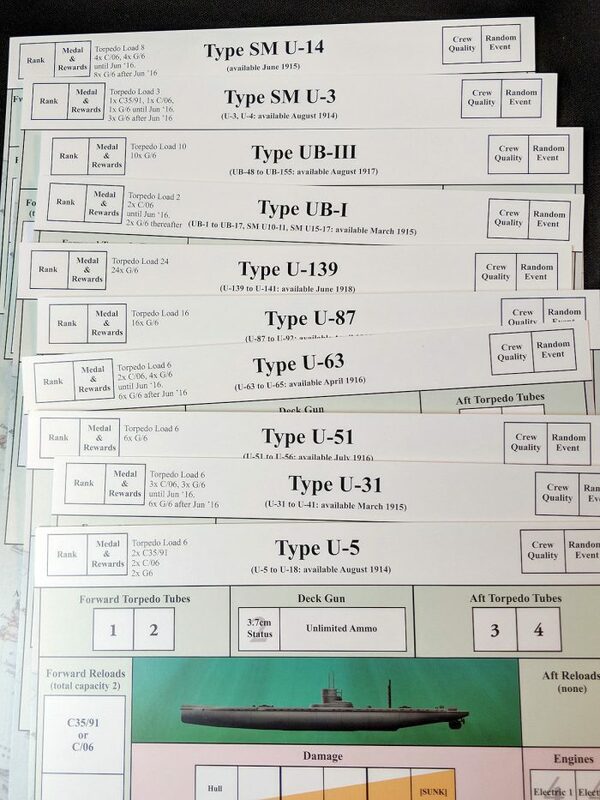 There’s ten two-sided sheets of U-Boat types you can command. It will be a fun challenge to start at the beginning of the war with a rinky-dink wind-up toy and hopefully survive long enough to get something more robust and powerful down the road. This game is a little different from Silent Victory in that there’s no game map to track your movement. Instead, it looks like you track your location on your U-Boat sheet. Need help coming up with a good German name for your U-Boat captain (other than Schweinhund or Jafurshurefromsweden)? 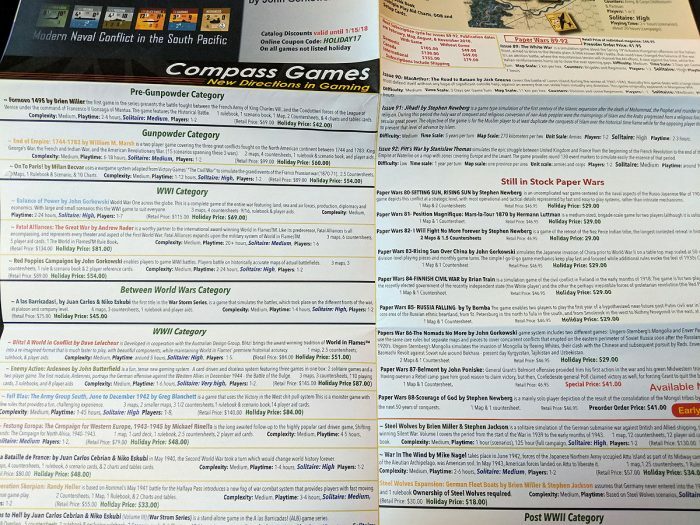 Well, you have a chart page for that. And there’s plenty more where that came from. 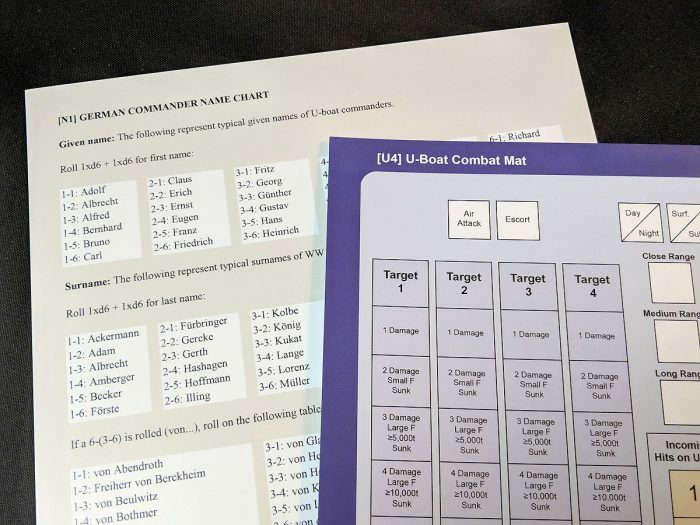 There are some historical German U-Boat skippers included in the game, which I assume is for recreating historical patrols. I believe Silent Victory did this same thing. 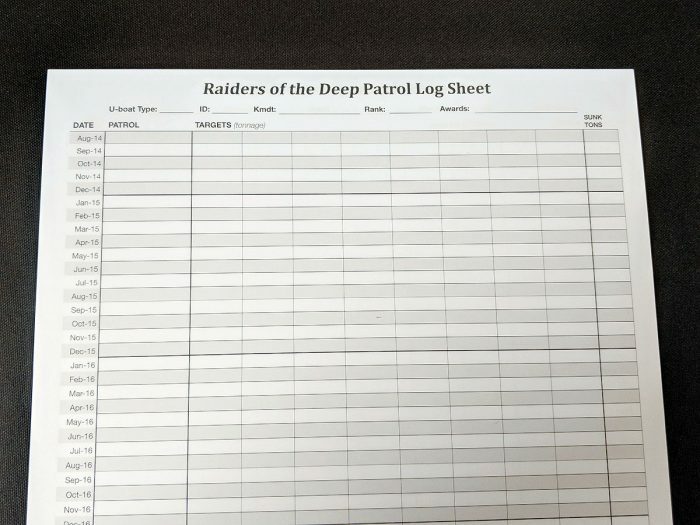 A Patrol Log sheet! 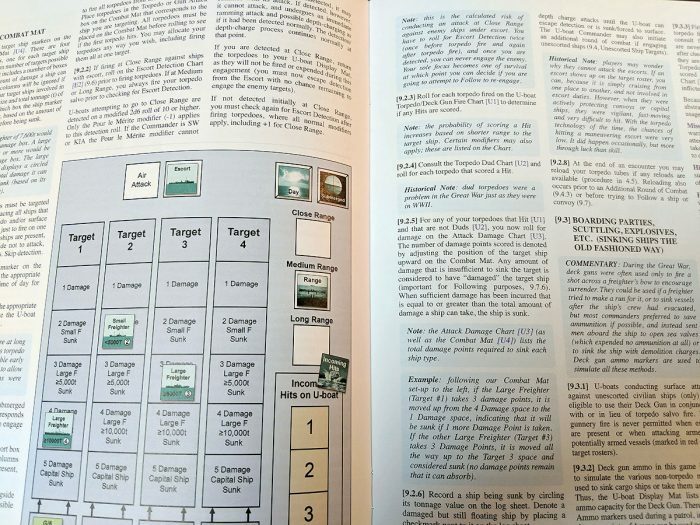 And it’s not just one that you need to photocopy; it’s an actual pad of them. There’s one countersheet, which is interesting in and of itself. I expected more counters, so this seems to be much more efficient. 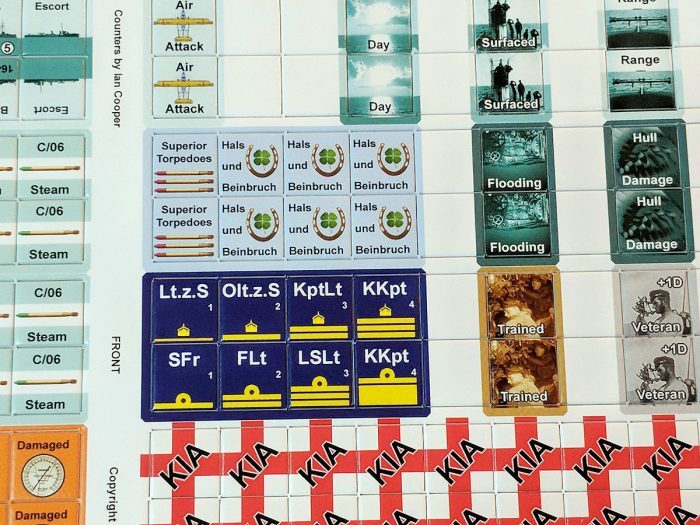 A close-up of the counters. 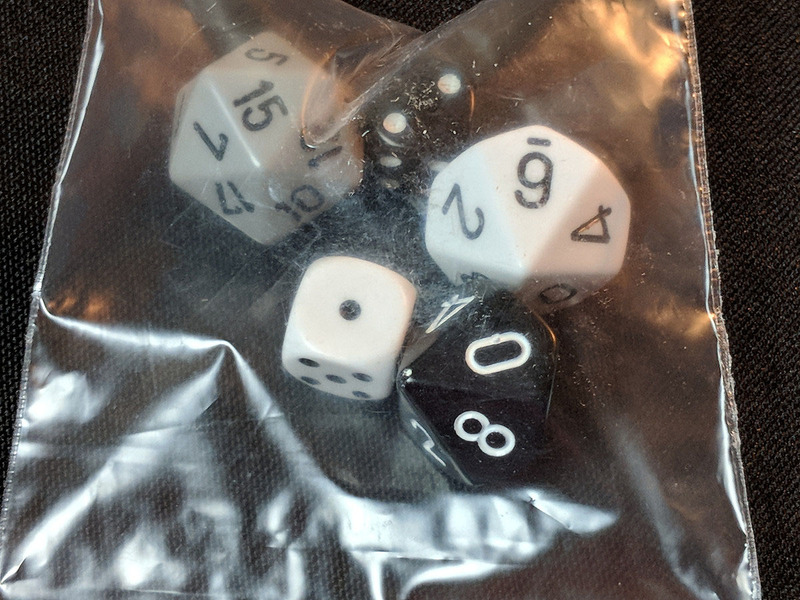 And a close-up of the dice! 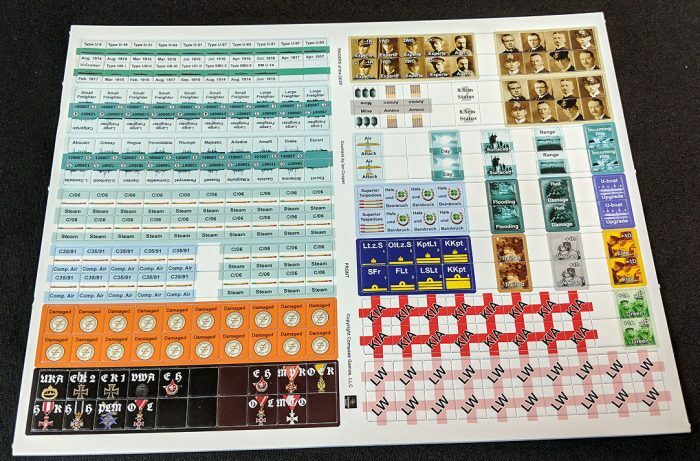 This should be a great game to get to the table. I’m looking forward to doing a full review of it as well.